You said you wanted to recommend books and journals that we didn’t have in stock. 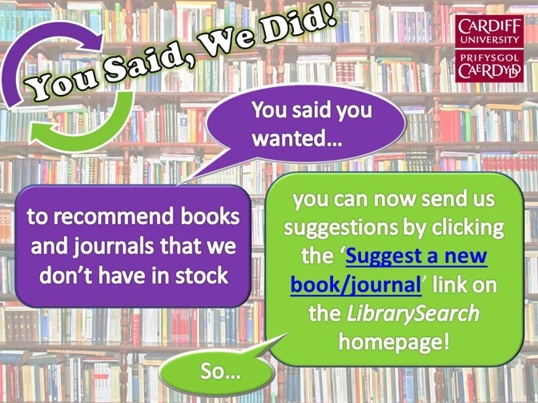 You can now send your suggestions by clicking on the ‘Suggest a new book/journal’ link on the LibrarySearch homepage! it would be very useful to have ‘Requistes in Dermatopathology” as the book is easy to understand and useful for dermatopathology. It would be really useful if the university had a subscription to the ADIS database. It’s connected to Springer but I can’t seem to access it. Lots of the latest pharmacokinetic articles are in there and they look really useful for final year projects. Thanks Rachael, I’ve sent you an email regarding this recommendation. I could really do with access to a online version of ‘The Organization of Behavior: A Neuropsychological theory by Donald O Hebb. Thanks.